For me, especially thinking about the future, anything could happen! I will catch myself worrying about the days my son is grown or my relationship changes and for what?! They are both right here with me now. I then pivot my thoughts to wondering how things will look and visualizing possible realities which seem beyond my grasp in their abundance. Worry to wonder is fun. I realized the new stage of my growth is allowing things to come and go and knowing it is all part of the process and my respect and understanding of the process allows me to be happy during the highs and lows of life. It is about stepping out of the little self, the mind, and taking in an all of time and space perspective. I trust the universe has me where I am supposed to be, and doing what I am supposed to be doing. I've noticed that on an evolutionary path there is a lot of going in and dealing with my stuff in order to move to the next phase. It is difficult and it has become easier. I've done a lot of inner work to be where I am and I will continue to do more to get to where I am going. I journal a lot which helps my perspective and clarity. 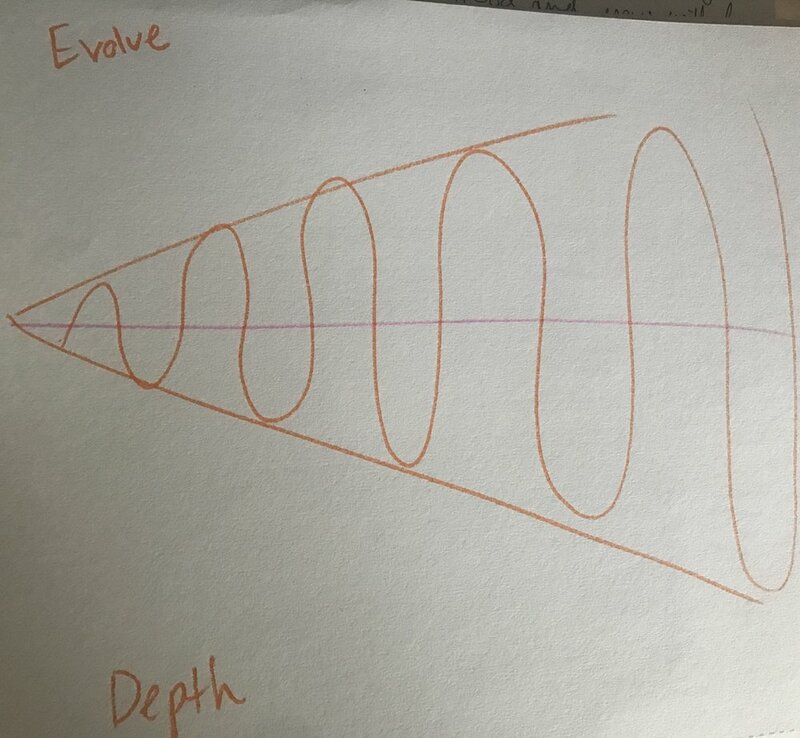 I was thinking about evolution and depth and I drew this image. The spanda, or pulsation of life has ups and downs. If you are are living in the flow with the universe you are expanding your capacity constantly. I'm so grateful to be able to really receive all the lovely groups and communities of people who are in my life. Without amazing people encouraging us to grow and speaking with candor and care how would we evolve? Thank you for your honesty and role in this in my life if you have shared your truth with me. I’ve become pretty comfortable with being uncomfortable and it has taken two years to be able to say that. I can be excited about resistance now because I know a break through is coming. I can be comfortable in the uncomfortable because I know it leads to more growth. Paradoxes are fun. Really, the uncomfortable and the erosion can be fun. All of time and space and the little stuff doesn’t actually matter as much as think it does in our minds.